New road construction operations. AGC trains Nevada’s workforce. Support renewal changes. On the road with Cat® Simulators. Meet our new curriculum developer. Our new Advanced Dozer in Road Construction is ready to train operators for infrastructure projects. Users will learn how to clear trees and boulders; build a pad, build and slope a ramp, a road, a drainage ditch and more. During exercises, the operator must accurately match the intended grade following a preloaded design profile. Teach operators advanced skills and get them ready to take on a multitude of new projects. Ask about the new Cat® Simulators Advanced Dozer System and accessories like VR Edition and motion. Meeting the demand for skilled operators can be challenging. The Nevada chapter of the Associated General Contractors (AGC) is training operators for the state’s workforce with Cat Simulators and high school students. Watch more on the successful program. Do you have a helpful operating tip? Submit a tip and receive a hat! We are offering a special discount on Support & Renewal at 50% off the normal price, if you still have a Generation 1 or 1.5 simulator model. We are no longer able to get parts or make any updates to software on Generation 1 or 1.5 Cat® Simulators models. Upon renewing your support agreement, our analysts can continue to answer questions or provide support materials relevant to the simulator model. Please don’t hesitate to call 1.877.434.7467 or 1.309.266.2640 or email if you would like to trade-in your obsolete model for a new simulator. Over the past few months, Account Manager Nate Hurn has traveled to Virginia for the HIRE Education Conference; Florida for a Waste/Landfill conference; and Springfield, IL for the Illinois Association of Aggregate Producers Conference. Hurn demonstrated Cat Simulators capabilities to many non-profit educational entities and private industry partners. “At each visit, I hear not only how fun the system is, but more importantly, about how these machines can truly assist with the training that beginner and experienced operators need, from the realism of the machine walkaround to the metrics that are captured,” says Hurn. With new advancements, like VR Edition (now on three models), Cat Simulators are in high demand for training and recruiting. Please welcome Anna Nabhan! 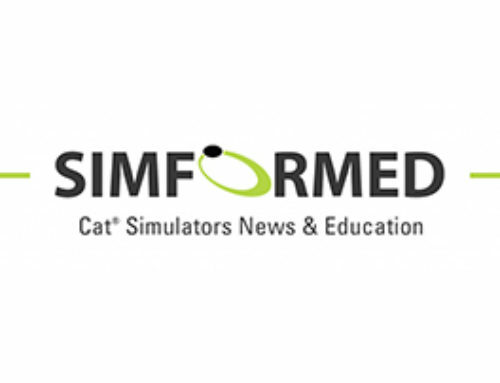 She’s joined the Cat Simulators team this month as our Curriculum Developer. Anna is a former teacher, who also worked at Caterpillar for several years. In this new position, she will be out in the field meeting our clients, gathering feedback, and writing a new curriculum for Cat Simulators training programs.